Internships provide students career exploration and “real world” experience that sets them apart in a competitive job market. Students who intern complete college and are employed at a higher rate than their non-interning classmates. For employers, internships provide educated employees at modest cost. For many, it’s an opportunity to test and train potential employees before hiring them as permanent members of the organizations. Host businesses and organizations also value knowing that they are assisting with workforce development – a critical need in this country – and making a meaningful difference in the life of a young adult. Supporting students in the types of transformational experiences internships provide is a goal of the College’s newly-approved strategic plan. In order to make paid internships more accessible to all Loras students, Loras College is currently working to build the Gateway Fund. This fund will assist with removing the financial obstacles that may inhibit a student from participating in an internship, such as giving up a paid position unrelated to their career goals. 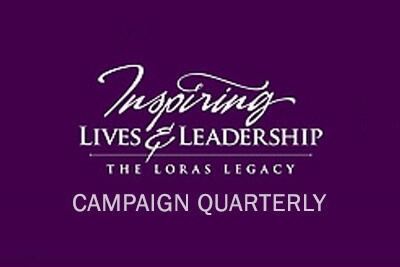 With initial funding received from Great Lakes Community Investments, Dr. Scholl Foundation and the Adducci Loan Fund, Loras has built the framework of the program, funding nearly 200 student internships in the past two years at businesses and nonprofit organizations. The goal of the fund is to raise enough to ensure that all students interested in obtaining an internship can do so, regardless of financial status.